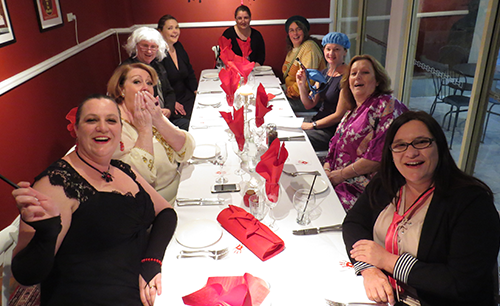 A Murder Mystery Party is a screamingly fun and unique way to celebrate almost anything. The Murder Master hosts all sorts of events. Hen's Parties are THE most popular event hosted. Buck's Parties are becoming more common; not everyone wants to get wasted and do a whole lot of silly stuff that they regret... or worse, can't remember! Significant birthday celebrations are a perfect reason for a get-together with friends and family. Throw in a perfectly good Murder, and everyone remembers what fun they had. The number of wedding anniversaries / relationship celebrations that I've hosted is phenomenal. A popular approach is to keep the whole thing a secret until the day itself, when the partner is presented with a costume. Of course, no-one would knock-off any boss who takes the team out for a good time (would they?)! Christmas parties are the obvious event; and there are quite a few office social-club functions etc. Keeping the troops involved and keeping up morale, especially during what can be quite a dry seminar or other function, can be a challenge. A Murder is a great way to rally everyone together and avoid that awkwardness which can sometimes descend of a group of people who really don't know each-other all that well. Break-up a day of careless relaxation with a gentle killing. This is a terrific way to enjoy each-other's company. Add an extra fun element to your party, and serve up a side-serve of deliciously deadly fun! 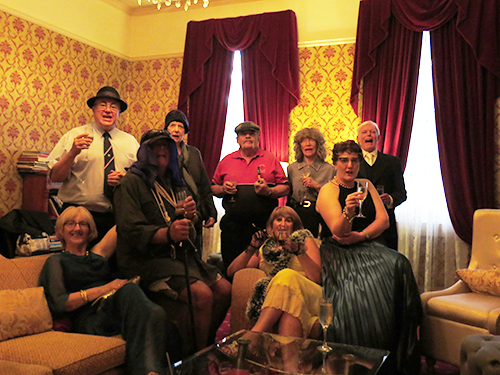 It doesn't matter what your planned event or function is, a Murder Mystery will take your event up another notch, and everyone will remember it. What storylines & themes are available?